The underlying assumption of nation branding is that countries have images, whether they manage them or not. Moreover, some believe that national images serve as stereotypes as they enable people to make sense of the world around them. Viewing national images as stereotypes leads to the conclusion that altering a nation’s image is a prolonged and difficult process. After all, people are more likely to process information that corresponds with their stereotype and ignore information that contradicts it. The strong association between a nation and its image is nowhere more evident than in Simon Anholt’s yearly Nation Branding Index. The Anholt-GfK Nation Brands Index is a yearly measurement of the relative strength of the world’s leading nation brands in the minds of global audiences (e.g., Germany, UK, USA, Canada). Each year, some 20,000 people from 20 countries are asked a series of 100 questions that enable Anholt to asses the relative strength of each nation’s brand. As Nicholas Cull writes, Anholt once joked that he had created the world’s most boring database as it displayed so little movement. The world’s leading brands, and the world’s weakest brands, remain pretty much the same year in, year out. Nation branding activities represent an attempt by nations to proactively manage their image. As national images serve as stereotypes, nations may attempt to cultivate or negate stereotypes that have taken toot in people’s minds, depending on whether their image is positive or negative. One tool currently used by nations to manage their image is digital diplomacy. This is due to the fact that content shared by embassies and foreign ministries on social networking sites (SNS) such as twitter and Facebook enables nations to promote a specific image amongst foreign populations. When examining content posted by the US State Department on twitter and Facebook over the duration of one month, I found that America’s self image was comprised of four elements including an attempt to mend relations with the Arab and Muslim world, an attempt to lead the battle against climate change and a commitment to diplomacy as a tool for achieving foreign policy goals. Thus, the US seems to be engulfed in the process of altering its image as a polluting, greedy empire that rests on military strength alone. An image that took root in peoples minds following a decade of wars, invasions and a global war on terror. However, an important question is what happens to national images during times of immediate crises (e.g., violent escalations between Israel and Palestine, Crimean crisis)? Do international crises derail nation branding activities as a nation must now focus on winning the war over public opinion? Such changes are quite evident in Israel’s case. During times of relative calm, Israel’s brand is comprised of three components: Israel’s position as the Middle East’s only democracy, Israel as a bastion of Western values in the Levant and Israel’s position as a world leader in technological innovation. Yet during times of crisis this image alters dramatically. For example, during the recent military camping in Gaza, the image Israel promoted on SNS included the following elements: its status as a victim of terror (#IsraelUnderFire), its role as the first line of defense against Islamic radicalization and violence, its right to safeguard the lives of its civilian population and a claim to moral superiority as the Hamas organization targets civilians as opposed to the IDF that targets militants. The same cannot be said for the US. Prior to the eruption of the Crimean conflict, the US State Department was attempting to restore brand “America” to its former glory. Yet as Russia began to threaten the territorial integrity of Ukraine, US digital diplomacy focused entirely on this escalating crisis. This led to a ceatain change in the elements comprising America’s self image. The first element was America as part of the international community. Tweets and posts published during the crisis portrayed the US as a member of this community rather than its leader. 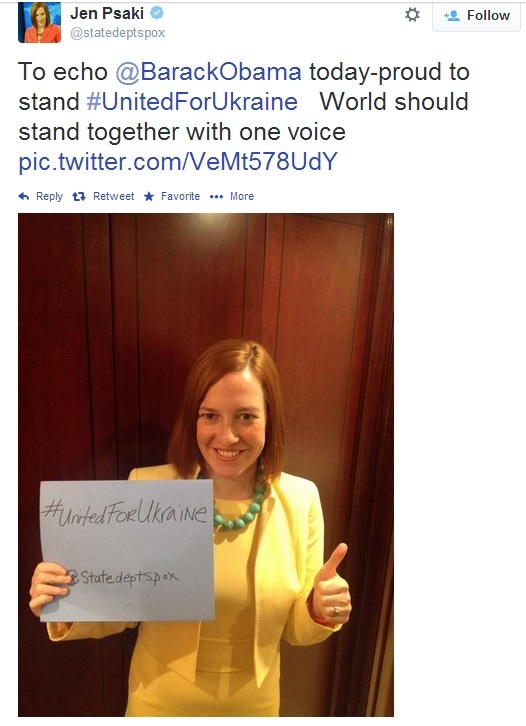 Thus, tweets often included hashtags such as #allies, #G7, #NATO and #UnitedForUkraine. Moreover, the US depicted itself as the guardian of international law and the rights of weaker states. US claims against Russia focused on the fact that Russia had violated international law when invading Crimea and that no nation may violate international law with impunity. But the US also focused on the need to impose economic sanctions on Russia and the rights of Ukrainians to decide their own fate in a democratic manner. It is these two elements which demonstrate that in the US’s case, the image promoted during a crisis was related to the image promoted during times of calm. By promoting economic sanctions the US demonstrated yet again that it no longer relies solely on military strength to achieve its foreign policy goals. By illustrating the rights of Ukrainians to decide their own fate, the US emphasized its standing as a moral leader and a promoter of democracy around the world. In summary, it seems that in some cases international crises do derail nation branding activities. At other times, nations may be able to incorporate their promoted self image into their response to crises. In its response to the Crimean crisis , the US demonstrated that nations may compete over public opinion during times of crisis while actually strengthening their nation branding activities. However, it is important to note that during times of crises, a nation’s image is also influenced by foreign actors. For instance, during the Gaza crisis Israel not only depicted itself in a certain manner but also the Palestinian leadership and Hamas organization. The same is true for the US that during the Crimean crisis illustrated Russia as a threat to global peace. The influence foreign actors have of a nation’s image is also evident in the results this year’s Anholt’s- GfK Nation Brands Index. Russia’s brand, for instance, suffered the greatest decline of all countries measured and it was especially poorly rated on the parameters of global security and peace. Posted in Uncategorized and tagged Anholt, Crimea, digital diplamcy, Gaza, Israel, Nation Branding, Nation Brands Index, Simon Anholt, Ukraine, United States. Bookmark the permalink.